Our NEW 'Smaller By Design' gifts are the same high quality you have come to except, just more compact and all under $35.00. 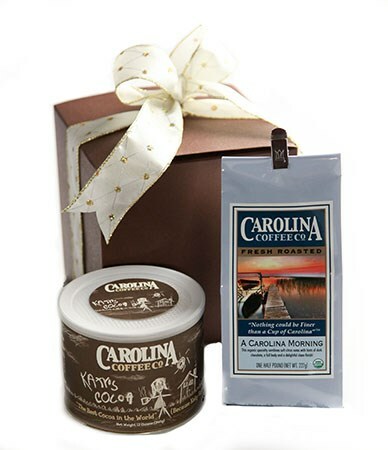 A half pound bag of coffee and a tin of Katy's cocoa is the perfect gift to warm up your heart and soul! You select the coffee and we'll wrap it all together in a gift box and tie it with festive ribbon for the occasion. An imprinted coffee scoop is tucked inside for scooping! !